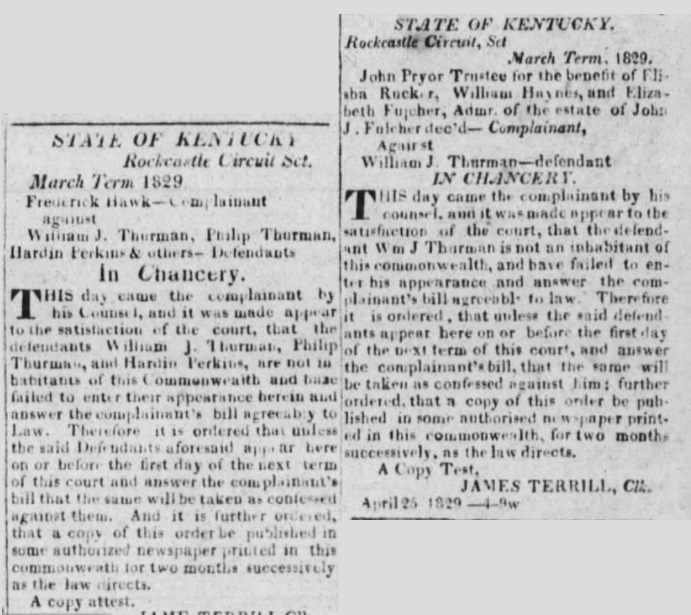 THIS day came the complainant by his counsel, and was made appear to the satisfaction of the court, that the defendant Wm J Thurman is not an inhabitant of this commonwealth, and have failed to enter his appearance and answer the complainant’s bill agreeable to the law. Therefore it is ordered that unless the said defendants appear here on or before the first day of the next term of this court, and answer the complainant’s bill that the same will be taken as confessed against him; further ordered that a copy of this order be published in some authorized newspaper printed in this commonwealth for two months successively, as the law directs. These surnames look familiar so I’m taking a guess… I think these folks are from Amherst County, VA. Mary Rucker married John Pryor in Amherst County in 1844 — long after this notice. He was born about 1818 (calculated from the 1850 Census), so he’s likely to be too young to be John Pryor the Trustee in KY. His father was also a John Pryor and was also alive in 1850, so there’s a possibility that he was the Trustee. These Johns were the son and grandson of Capt. William Pryor, the Revolutionary War pensioner. The Haynes name also points to Amherst County. Thomas M Pryor married Elizabeth Haynes in Campbell County, VA in 1843 and after living awhile in MO, they were living in Amherst County at the time of the 1880 Census. 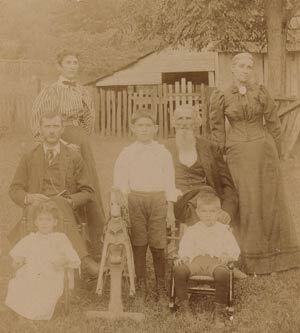 Mary Rucker (the one named above) is reported by researchers to be the daughter of Peter Rucker and Jane Haynes. Other researchers have reported that William Haynes on the 1850 Census in Audrain County, MO was married to Mary “Polly” Pryor (she was born 1781 in VA per the census entry). 1805 Deed in Stewart County, TN – William PRYOR deeded land to William Haynes, witnessed by Benjamin Downs and W.M. Hicks. Interesting, but I think the Pryor-Haynes connection to Amherst County is more likely. Remember the will of David Crawford that was filed in Jefferson County, KY, but witnessed by a John and William Pryor in Amherst County, VA? (see post). David Crawford willed “to my wife part of land where “I now live,” bought of Robert Johnston and William Haynes.” Isn’t it interesting there were two Pryor and Crawford marriages in Mercer County in 1795? And Thurman or Thurmond… there were neighbors of this name near the Pryors in Amherst County. These surnames are on the 1783 State Enumeration of Amherst County: Haynes, Pryor, Rucker and Thurmond… and a John Fulcher. There’s an Elizabeth Fulcher who was head of household in Amherst County in 1810. Elizabeth could be John’s widow and admin of his estate as a John Fulcher married Elizabeth Huckstep in Amherst County on January 4, 1788. The notice on the left newspaper notice also caught my eye because it’s another suit against William J. Thurman (aka Thurmond?). It names Frederick Hawk, plaintiff vs. William J. Thurman, Philip Thurman, Hardin Perkins and other defendants (Who were they?). The name Philip Thurman jumped out to me because there was a man by that name in Amherst County. When I looked for these men on census records I found there was a Hardin Perkins in Buckingham County, VA. There were a few Philip Thurman/Thurmond names, however in 1810 there was both a William Thurman and Philip Thurman (and several more men of this name) counted in Lincoln County which boarders Rockcastle where the the complaint was filed. I also looked on this census for names that begin with “P” and there are a couple where the handwriting is so bad they could be Prior. Ancestry has the last one on the “P” page indexed as “John Pavi”. Well, I’m not going keep us all in the dark for another post. At least these Thurmonds were from Amherst County. William J Thurmond and Philip Thurmond noticed the deposition of William Thurmond in AMHERST COUNTY VIRGINIA in the same court and in the newspaper The Olive Branch and Danville Advertiser on November 17, 1825. Looks like we have some more researching to do!